To exchange information: The main objective of business communication is to exchange information with internal and external parties. Internal communication occurs within the organization through orders, instructions, suggestions, opinions etc. To develop plans: Plan is the blueprint of future courses of actions. The plan must be formulated for attaining organizational goals. In order to develop a plan, management requires information. In this regard, the objective of communication is to supply required information to the concerned managers. To implement the plan: Once a plan is prepared, it is to be implemented. Implementation of a plan requires timely communication with the concerned parties. 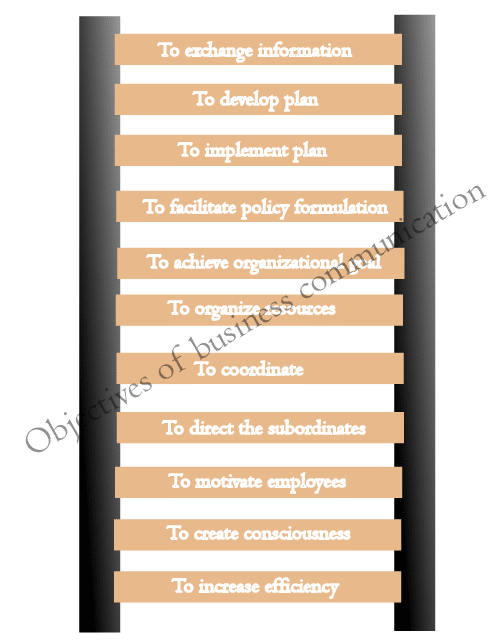 Thus, communication aims at transmitting a plan throughout the organization for its successful implementation. To facilitate policy formulation: Policies are guidelines for performing organizational activities. Policies are also termed as standing decisions to recurring problems. Every organization needs to develop a set of policies to guide its operation. Preparing policies also require information from various sources. Therefore, the objective of communication is to collect necessary information for policy formulation. To achieve organizational goal: Collective efforts of both managers and workers are essential for achieving organizational goals. Communication coordinates and synchronizes the efforts of employees at various levels to achieve the stated goals of the organization. To organize resources: Various kinds of resources are available in an organization such as human resources, material resources, financial resources and so on. In organizing these resources in an effective and efficient way is a key challenge to the managers. Communication is the vehicle to overcome this challenge. To coordinate: Coordination is a basic management function. It involves linking the various functional departments of large organizations. Without proper and timely coordination, an achievement of organizational goals is impossible. Therefore, the objective of communication is to coordinate the functions of various departments for the easy attainment of organizational goals. To direct the subordinates: The job of a manager is to get the things done by others. In order to get the things done, management needs to lead, direct and control the employees. The performance of these managerial functions depends on effective communication with subordinates. To motivate employees: A pre-requisite of employee motivation is the satisfaction of their financial and non-financial needs. Financial needs are fulfilled thorough monetary returns. However, in order to satisfy non-financial needs, management must communicate with employees on a regular basis both formally and informally. To create consciousness: Employees of an organization must be conscious regarding their duties and responsibilities. Communication supplies necessary information and makes them conscious about their duties and responsibilities. To increase efficiency: In order to increase employee efficiency, they should be provided with necessary information and guidelines. Communication supplies such information and guidelines for them. To bring dynamism: Organizations should be dynamic to cope with the internal and external changes. Bringing dynamism requires finding new and better ways of doing things. For this purpose, communication helps to seek new ideas and suggestions from the internal and external parties. To improve labor-management is relationships: Harmonious relationship between workers and management is a prerequisite for organizational success. In this regard, the objective of communication is to ensure the free and fair flow of information and to create good understanding between them. To increase job satisfaction: Communication enhances job satisfaction level of employees. It creates a friendly environment where employees can express themselves. As a result, they become more satisfied with their job. To convey employee reaction: Communication conveys employees’ reactions, opinions, suggestions, and complaints to their superiors about the plans, policies, programs and strategies of the company. To orient employee: Communication orients the new employees with the company’s policies, rules, regulations, procedures etc.